The core mission of our Deaf Dogs Rock Rocker Puppy program is to set up each deaf puppy/dog for success by sending them into a experienced special needs rescue where they go into a experienced deaf dog foster home that is committed to training and socializing each deaf dog that comes into their care. This way each foster advocate gets the opportunity to live with the deaf dog, work with the deaf dog and accurately evaluate each deaf dog/puppy to make sure to match the dog with the right home once the adoption screening process starts. The adoption screening process is very thorough. Each interested family must fill out an adoption application that asks lots of questions and a full list of references is required to be considered for adoption. We work with shelters, rescues, private individual and breeders to help get each deaf puppy into our program to make sure each deaf dog/puppy gets the individual training, socialization, and love to grow up to become a cherished member of society. 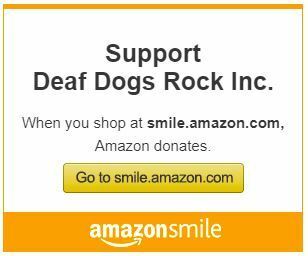 Deaf Dogs Rock is a judgement free zone and are here to help deaf dogs and puppies get a fresh start and a chance at a great life. When screening potential homes for a deaf dog/puppy, there are many guidelines to follow like checking all references, talking to the applicants veterinarian and performing a thorough home visit to make sure each home is a safe place for a deaf or deaf/blind dog. This is why our Deaf Dogs Rock Rocker Puppy is so important to set each deaf pup up for a successful happy life in their new home. Our Rocker Puppy program financially sponsors each deaf dog/puppy so the dogs can be spay/neutered before they are adopted to a new family. We only work with rescues and advocacy organizations who are committed in making sure each deaf dog/puppy is spay/neutered before being placed in a new home. It is our number one mission to make sure each deaf dog and puppy gets basic training, socialization. are in a loving and caring foster home where their confidence soars. Our partners set each deaf dog up for success. Jan – November 2018 Deaf Dogs Rock has sponsored a total of 130 deaf dogs and puppies into rescue. In January 2019, our Deaf Dogs Rock community sponsored 14 deaf dogs into the safe harbor of rescue so they can start on their new journey to finding their forever homes. 1/02/19: When we found out about Scoob at the Macon County Alabama Humane Society we wanted to help him out by sponsoring him so he could be vetted to get ready for adoption and be listed available for adoption on our Adoptable Deaf Dogs Section on Deaf Dogs Rock. Update 1/31/19: We just found out on 1/31/19 that Scoob has been officially adopted. From Caroline Walker-Trulock with Almost Home Rescue in Katy Texas – These are special babies. They were all dumped at just a few weeks old in Melrose Park; a horrible dumping ground for dogs in Houston,TX.They were in a box. Helpless and scared. They would have died. Almost Home Pet Rescue took them in. Cheslee Miller Escobedo fostered them. While caring for them, Cheslee realized one of the puppies was deaf. We always want to do what we can to make sure our puppies have a good start in their new lives. We see so much heartache, abuse and neglect… the goal is to better the lives of each dog/puppy we take in. We reached out to a wonderful group we have partnered with who are amazing with special needs dogs. Like so many good rescues, they cannot help every dog. They are stretched to the limit so we are so grateful they could find a spot for Rhea. We are so grateful to Green Dogs Unleashed and Deaf Dogs Rock for sponsoring her. Rhea made her journey to Virginia this weekend where she will get training for her hearing impairment. We couldn’t have done it without the Highway Heroes Rescue Transport Volunteers. ; they are so incredibly awesome. Rhea’s sister Randi was adopted today by a family who tragically lost their dog to a sudden health issue a year ago; they were devastated. They saw Randi and decided they were ready to bring in a new family member. They fell in love. Photo above: Christina Lee helping to transport Rhea to her final destination to Green Dogs Unleashed in Troy, VA. Rhea will be sponsored into rescue through our Deaf Dogs Rock Rocker Puppy Program which will pay for her vetting to be spayed so she can become available for adoption soon. Sweet Mylee was living out on a goat farm and her owner was worried she would be attacked by coyotes because of her deafness so she sent her to our partner rescue Green Dogs Unleashed and Deaf Dogs Rock sponsored her into rescue. When we were contacted by the Sedona Shepherd Sanctuary telling us about deaf German Shepherd Shellie who desperately need a full ear ablation surgery we wanted to offer a medical sponsorship for her to go towards some of her mounting medical expenses. Deaf Dogs Rock sent in a donation of $300 to go towards her vetting to help out the sanctuary so they can help the next dog. If you would like to help Shellie, click here to go to her fundraiser. From Lisa Fardella with Sedona Shepherd Sanctuary: Shellie is an easy going, super sweet German Shepherd who was found wandering the streets of Philadelphia in the summer. Sedona was able to rescue her from a shelter before she was euthanized due to overcrowding. Once Shellie settled into the program it was obvious that she had medical issues that needed to be attended to. The biggest concern is the chronic ear infections in both ears. We tried everything to get the infections under control without surgery but it wasn’t enough. She had to have ear ablation surgery. She’s such a sweet girl and even though she was in pain she always remained so sweet. She was recovering in a foster home but is now back in the hospital for 5 days for a round of special antibiotics to treat the remaining bacterial issue. She will have 3 IV treatments then she will go back to her foster home. Sedonas mission is to rescue and re-home adult and senior German Shepherds. We also focus on special needs and special situation dogs, like Shellie, so as you can imagine we have high medical expenses and isn’t look for innovative ways to defray these costs. Your support is greatly appreciated. Our partner rescue Green Dogs Unleashed stepped up and took in two deaf and deaf/blind Foxhound 11 week old puppies. Welcome Elas (deaf and visually impaired) and Olaf (deaf) to Green Dogs Unleashed. These two will each receive a Deaf Dogs Rock Rocker Puppy sponsorship so they can get spayed/neutered to get ready to be available for adoption. We had several people reach out to us because deaf boxer Harley was on borrowed time so we reached out to Green Dogs Unleashed and they found a foster for in Richmond for Harley. Harley is now safe and sponsored into rescue by our Deaf Dogs Rock Rocker Puppy Program. We had several people contact us about Star needing help because she was deaf and out of time. We put up a DDR Rescue plea for her through our Rocker Puppy Program and PJ’s Bull Rescue out of MN pulled her and got her into foster care and got her spaying and vetting done. Because of your generous support Deaf Dogs Rock sponsored Star so she could be vetted and hopefully find a loving forever home soon. Star relaxing in her foster home. From PJ’s Bully Rescue: We are happy to report she is doing amazing in her foster home. She is healing well from her spay and loving her new fur foster sibling. They have quickly become close friends. Melissa, her foster mom, reports she is a sweetheart to the max and loves to cuddle. I had the pleasure of doing her evaluation for the rescue and am so excited to be a part of her journey into a forever home. We will share her journey on our Facebook page and hope you will follow her updates! We put out a rescue plea for deaf dog Dolly who was at the Granville County Animal Shelter and the shelter was completely full. The SPCA of Franklin County NC pulled Dolly so she is now safe. Thanks to our supporters we were able to sponsor her vet care to get her ready for adoption. When we heard from a young lady in Memphis TN who needed to find help for her 6 month old boxer Joy we jumped at the chance to try to help. We got in contact with Green Dogs Unleashed to see if they had room for deaf boxer Joy. Joy arrived January 28 to Virginia from TN through the Highway Heroes Rescue Transport Team. Joy is also the first boxer dog to be sponsored through Nitro’s fund a special fund set up to honor the memory of our deaf dog Nitro to help deaf boxers in need. You can read more about Nitro’s Fund by clicking here. Above photo: Here is deaf/blind 7 weeks old puppy Ethan who came to Speak St. Louis for help. We always want to help the most precious of special needs puppies so they can get a good start to their new life and also so they can go to loving forever homes. Gavin, a Rough Coat Collie, was found near a busy intersection. His owner was located and she agreed rescue was a better option for him. Age unknown, guess is 4 years and he is such a love bug! A big shout out to Speak St. Louis for getting Gavin into rescue so he can be vetted and find a home with someone who will cherish him and always keep him safe. Sweet 12 week old deaf puppy Saylor (female) was surrendered to a shelter in MO because the owner said he did not have the money to go to puppy class for training. It’s a shame the owner did not go to our Deaf Dogs Rock Training blog to get started but maybe it is just as well because now Saylor will go into foster care through Speak St. Louis and learn some basic foundation training while potential homes are being thoroughly screened. Speak St. Louis does an amazing job finding these beautiful special needs babies new loving forever homes. We are honored to work with them often and our Deaf Dogs Rock Community will be sponsoring Ethan, Galvin and Saylor so they can get the vetting they need to be ready for future adoption. Deaf Dogs Rock put out a rescue plea for deaf cattle dog Ferrigno who was at the Harris County TX shelter. We were so happy to hear that Belle’s Buds Rescue pulled Ferrigno and got him safely into foster care where he can settle, learn new things and become available for adoption soon.